Hannan freshman student and football player Nathaniel Wilson pictured with his mother Danielle Wilson. 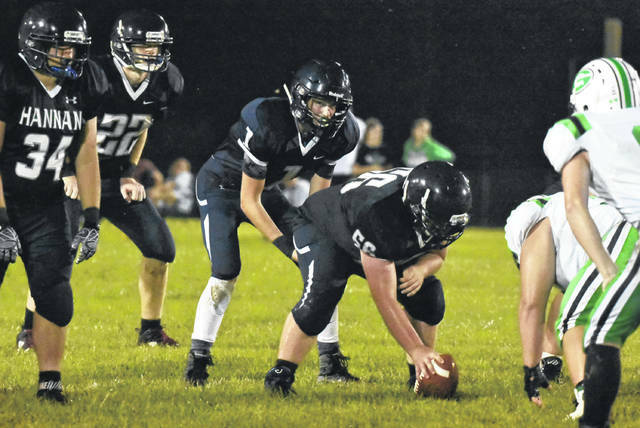 Hannan quarterback Matthew Qualls, pictured here at a game earlier this season, helped call the play, and lead the way for Nathaniel Wilson’s first touchdown, as did fellow Wildcat players with support from players from Buffalo High School. 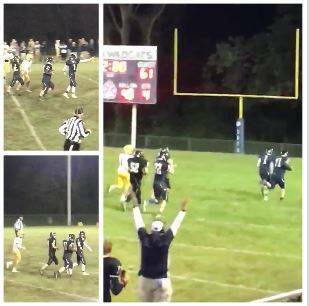 Screenshots from the video of Nathaniel Wilson’s first touchdown. ASHTON — It does not matter whether a game is lost or if a game is won, a winning moment can make a player feel victorious. During Hannan High School’s home varsity football game against Buffalo High School last Friday, the football players of both teams gave a winning moment to Hannan’s freshman player, Nathaniel Wilson. Nathaniel was diagnosed with autism at an early age and has overcome quite a bit throughout his years. Danielle Wilson, Nathaniel’s mother, shared during the fourth quarter Nathaniel was put into the game. 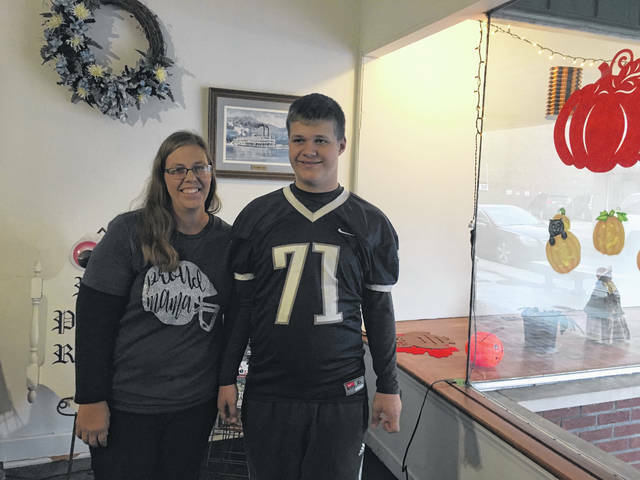 “He had played one play on the offensive line and then they called a timeout, about 20 seconds left on the clock, then his play was the last play of the game, then he scored his touchdown,” said Danielle. Quarterback Matthew Qualls handed the ball off to Nathaniel who scrambled forward for yardage, then Qualls caught up to Nathaniel, motioned for him to take his hand to keep running and guided him towards the goal. Meanwhile, all the rest of the football players, from Hannan and Buffalo both, followed along behind him on his way to make his touchdown. Afterwards all of the players congratulated him, no matter the color of their uniform. “It was good…it felt amazing,” said Nathaniel. Danielle commented one of Buffalo’s football coaches was a former coach for the Hannan team and his wife is a friend. She was unaware the players were going to let Nathaniel make his touchdown as they did. His teammates have welcomed him onto the squad and have been supportive to him, treating him like he is a part of the family. He joined the team a bit later in the season, this game being his third game in which he played and the first time he ran the ball and the first time he made a touchdown. Prior to this game, he played defense. “This has been a good experience for him this year, socialization is one of his struggles, his friendship base is not your typical friendships, so it warms my heart whenever I see one of the boys come up to him and tap him on the shoulder when they’re out there…they’ve been really great with him,” said Danielle. Nathaniel dabbled in sports like tee-ball and soccer when he was a young boy, but did not have much interest. He enjoys his alone time. This year, Hannan’s Football Coach Kellie Thomas reached out to Nathaniel about joining the football team because he showed strength. Nathaniel decided to give it a try and has worked to earn his spot on the team. “He has really enjoyed it, he says he is going to continue to play…he really likes it though, he likes being around those boys, I mean even though he may not always show it as someone being excited…I can see it, everytime someone asks him about football his face lights up with a smile. So people who really know him and ask him, he really, really does like it. I think it’s helped him with the social aspects too,” said Danielle.